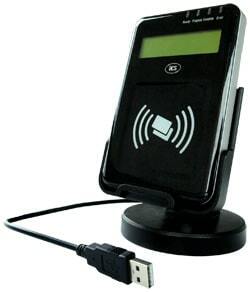 Advanced Card Systems has launched a USB-connected NFC reader equipped with a two-line LCD screen. The ACR1222L VisualVantage can read ISO 14443 Type A and B cards, Mifare, FeliCa, 4 NFC Forum tag types and offers USB connectivity and three SAM slots. The LCD display offers multiple language support, including Chinese, English, Japanese and some European languages. The new device joins an existing product, the ACR122L reader, which connects to its host via RS-232. “We are confident that the ACR1222L, with its added features, can help end-users fully appreciate the ease and convenience of using contactless technology,” said ACS’s Elsie Lai.